But critics say the move is an attempt to strengthen the Republican Party's vote ahead of congressional elections. 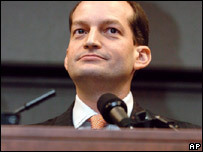 Miami-based US Attorney Alexander Acosta said the measures would allow the US to better enforce its sanctions against Cuba. "The purpose of the sanctions is to isolate the Castro regime economically and deprive the Castro regime of the US dollars it so desperately seeks," said Mr Acosta. Miami is the unofficial capital of the Cuban exile community, a key segment of the Republican vote. The BBC's Emilio San Pedro says such tough talk will be welcomed by the most conservative segments in the community who see the failing health of Cuban President Fidel Castro as an opportunity to bring about political change on the island. Mr Acosta said anyone convicted of breaking the trade embargo would face the possibility of a 10-year prison sentence and a hefty fine. The task force will include the FBI and law enforcement units from the Treasury, Homeland Security and Commerce departments. It represents the latest move to tighten the restrictions on US-Cuba relations. Limitations were first imposed in the early 1960s and have been expanded since.